One of the benefits to having my own domain is the ability to create as many custom email addresses as I want. When I sign up on a new website, I create a custom email just for that website and redirect it to my “main” email account. Today, I received a junk email for the email address I set up only for the NBC Store. It is a “amazon delivery” notice with a “confirmation link” that redirects to a website in Spain. Since I have never used the email address for the NBC Store anywhere else, and since it was sent directly to that alias account I created, I think it is safe to say the NBC Store’s customer email server has been compromised. 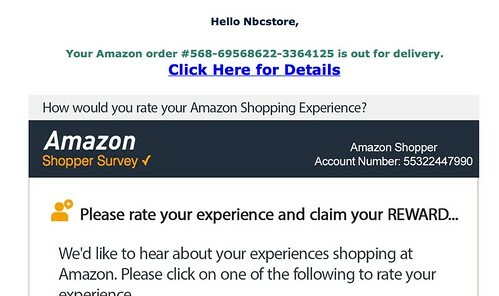 If you have an email account with the NBC Store, get ready for a flood of junk mail and malware. You don’t have to own your own domain to set up a “ghost” email address. Google lets you create something similar with any gmail address! On the next website that wants you to sign up with your email address, type a + sign after your gmail name and before the @ to make a “ghost” email address that will forward to your main gmail.com address. For example, if bill.gates@gmail.com wanted to sign up at the NBCSTORE and wanted to use a “ghost” email address, he could just type in bill.gates+NBCSTORE@gmail.com at NBC Store’s website. NBC Store would send their emails to bill.gates+NBCSTORE@gmail.com and Bill would see it in his regular bill.gates@gmail.com inbox as coming from bill.gates+NBCSTORE@gmail.com. While this takes longer than just putting in a standard email address, I find “ghost” email addresses are invaluable in finding out who sells email addresses (LinkedIn), who keeps them reserved (Apple, Microsoft), and on occasion, who has been hacked. In the “yeah, that’s bad” department, Kidde announced a massive recall of their plastic handle fire extinguishers that were manufactured between January 1, 1973 and August 15, 2017 due to failure “to activate during a fire emergency due to clogs”. There’s a long list of all extinguishers affected by the recall on Kidde’s website and even a grim admission that “there have been approximately 391 reports of failed or limited activation or nozzle detachment, including [a] fatality, approximately 16 injuries, including smoke inhalation and minor burns, and approximately 91 reports of property damage” with those affected models. If you find that you have one of their fire extinguishers, check out the recall list or call Kidde toll-free at 855-271-0773 from 8:30 a.m. to 5 p.m. ET Monday through Friday and/or 9 a.m. to 3 p.m. ET Saturday and Sunday to get yours replaced ASAP. most recent version of the app (QNAP Qfinder Pro 6.3.0) now collects information on your NAS usage. You can click CANCEL and not OK at the legalese screen after the software installs, but it isn’t immediately apparent if this exempts you from the new TOS or is just a “close window” action. User information and user behavior helps the Company to better understand user habits and preferences. The Company collects such information to improve the Product and services to meet the needs of users and to improve the overall service quality. Operating system information, device identification codes, country and language settings, computer model, firmware version and other basic information. App-related information including: version information, update and shutdown time, usage frequency, and usage time. User preferences: device settings, product configuration, usage time of the application and hardware. Other relevant but non-personal information. With your agreement, the aforementioned information will be automatically collected and sent back to the Company. The Company will analyze the collected information to identify improvements that can be made to future products and services. The Company has effective mechanisms and procedures to protect the security of the information collected and shall only use the relevant information internally. The Company hereby disclaims all warranties including express or implied warranties of merchantability or fitness for any particular purpose in connection with this consent or in any manner whatsoever. In addition to the foregoing, the Company shall not be held accountable for any direct, indirect, special, incidental or consequential damages, such as loss of profits, loss of data, equipment use or functional damage, interruption of business and events of a similar nature, regardless prior notice exists for such occurrence or not. The Flickr forum for questions on this migration is here. This shutdown will NOT affect “regular” Flickr users or photos hosted on their service. Only the Photo Book and Wall Art sections will be discontinued. In a late night email I just received, Microsoft announced it is shutting down their Groove music service as part of their upcoming merger with Spotify. If you have any albums or singles through their service, you have until December 31st to download them before they are deleted. There’s going to be a lot of discussion about gun control in the next few weeks. Most of the gun control debates are going to be over varying levels of trivia. The stock type of a rifle. How many rounds of ammunition a magazine can hold. The type of handle used for a rifle. For the wealthy, this is all bread and circuses. What I have yet to see in any gun control debate is a discussion on how the wealthy have access to a completely different level of firearms through “taxes”, careful application of the law, and very specific turning of phrases. To start with, the act of purchasing a “civilian” firearm is fairly straightforward. You walk into a firearm store, pick a firearm, fill out the appropriate ATF form, and depending on whether you pass the background check, walk out the door 10 minutes later with your choice from the rack. Fully automatic firearms and “specialty” firearms are a different matter, though. For most people who are not familiar with firearms, a gun is a gun. However there is a very important distinction in firearms: whether they are semi-automatic or fully automatic. The difference between a fully automatic and semi-automatic firearm is what happens when you pull the trigger. A semi-automatic firearm discharges once when you pull the trigger and that’s it. To make it fire again, you have to pull the trigger again. Those kinds of firearms are (mostly) legal for most individuals to own (pistols or rifles) under the current laws of the United States and sub-laws of the states themselves. Fully automatic firearms are completely different. There’s a lever you can set on the side of a fully automatic firearm that lets you choose what happens when you pull the trigger. One setting matches the semi-automatics: one trigger pull equals one discharge. The other setting, the full-automatic one, will let the firearm continue to fire until you either release the trigger or the firearm depletes the ammunition it has access to. Ammunition will expend quickly, but the target will be perforated with bullets far more rapidly than any single trigger pull sequence could ever achieve. No “regular” firearm store carries fully automatic firearms on their shelves. Fully automatic firearms are generally referred to as “machine guns”, and are (mostly) not straightforwardly legal to own as an individual. Mostly doesn’t apply to the wealthy. Let’s say Poor John Doe wants to buy a fully automatic firearm. Since he doesn’t have a lot of money, he’s out of luck. End of story. If he ever comes into ownership of a fully automatic firearm, he’s looking at spending a very long time at a not-so-friendly federal penitentiary. Now all RIch John Doe has to do is pay. Pay an exorbitant upfront fee for the firearm itself (anywhere from $10,000 to $300,000), pay a special “tax” for owning the firearm, fill out a few dozen forms, apply (any pay again) for any extra “tax stamps” the firearm requires, get approval from both the ATF and the local chief law enforcement office, and finally send in photos and multiple forms of ID to everyone in the exchange. All that is all just a matter of money and time. Rich John Doe has plenty of both. Ah, but it gets better! But Rich John Doe does have a way out. All Rich John Doe has to do is go to his local neighborhood attorney’s office and set up a “trust”. A trust is a legal setup to allow for “company” ownership among distributed individuals. Ideally, this would be reserved for boring company assets like cars and condos, but trusts also apply to firearms. This trust rule for firearms was intentionally written into the 1934 National Firearms Act and still applies today. Back to Rich John Doe. Rich John Doe goes to his attorney and sets up a trust and calls it HAPPY BANANAS and adds his good friend Rich Bob Doe. In a few weeks, the trust is “established” legally. Nevermind Rich John Doe and Rich Bob Doe are the only two in this trust. That doesn’t matter. A trust is a trust, no matter how many individuals are in it. Trusts meet the legal definition of a person even though they aren’t. Once HAPPY BANANAS is up and running and all the paperwork is cleared, Rich John Doe goes back to the dealer and the fully automatic firearm is ready for the TRUST to pick up. His TRUST pays for the firearm and the firearm is registered to his TRUST. Not him or Rich Bob Doe because the TRUST owns it. But Rich John Doe AND Rich Bob Doe can use the firearm anytime they want. A trust can own most any kind of firearm that is registered to it. Weapons and accessories that make the selection at the “regular” hunting store look like Nerf toys. Anyone in the “trust” can use and keep the firearm whenever they want, and more people can be added to the trust anytime with an attorney’s expert help. So, to sum up, a “new” fully automatic firearm (AKA: a machine gun) is out of the question, but you can get any of the 182,619 fully automatic firearms that meet the above criteria for anywhere from $10,000 to $300,000 each. Not a problem for Rich John Doe. Nobody talks about this level of firearm ownership because it is almost financially incomprehensible. Spend years and years of salary on a single firearm? But now, Vegas happened. The shooter (at the time of this post) was supposedly a millionaire and used multiple fully automatic firearms. Did the shooter have access to these fully automatic firearms through a trust? Did the shooter pay for each of these fully automatic firearms with the millions he had? Did the shooter pass all the criteria for owning multiple fully automatic firearms without raising any red flags? The wealthy have access to a different level of firearms. More detailed information about fully automatic firearm ownership is on the ATF’s website. I’m constantly amazed at the level of tech we are achieving in a relatively short period of time. The “future” is coming fast, and sometimes in ways that even the best of science fiction didn’t anticipate. Imagine hundreds or thousands of drone-based ships in the ocean, playing basic defense and surveillance “over ocean areas as large as a million square kilometers”. This 24/7 armada would “hold the line” so to speak, and keep the Navy’s “12 aircraft carriers, 52 attack submarines, and 18 ballistic- and cruise-missile submarines” on a more focused and as-needed basis. Of course CDMaST is going to be target #A1 for hacking, and CDMaST is probably going to be the focus of some terrible movies when the mainstream media gets wind of this, but the idea that technology has reached the point of 24/7 global defense is astounding. The article is on the Military and Aerospace website here. In other words, it looks like every DJI flght was copied to DJI / China’s HQ. The actual Army memo and breakdown is on a sUAS news site, the sharing / data collection of DJI drones is on another sUAS page, and the ban is cross-confirmed on the UPI news site and the Military and Aerospace page. Today Apple announced their new shiny shiny – the iPhone X. The gold mine of biometric data won’t be held in Apple’s Fort Knox, but shared “on the open road” with third parties? Read Apple’s statement again. The biometric data points are not generated and deleted with every use. They are stored. On the local phone. That stored information will be shared with third-party apps. Biometric scans are a mathematical algorithm. Your facial patterns create an identifier unique to you. There’s no changing it. Once your unique biological mathematical algorithm is out in the open, there’s absolutely no way to put that genie back in the bottle. The last cornerstone of individual security will turn to dust. I expect the first public-aware hack in two years. While most people outside of Texas think concealed carry is something best left in the wild west era, for most Texans, it is a part of everyday life. Regardless of your stance, there is a law on the Texas books that affects the evacuees of Hurricane Harvey that conceal or open carry their firearm. In 2007, the Texas legislature passed the “Emergency Powers Act”, which coincided with the arrival of Hurricane Katrina and the (alleged) confiscation of firearms by the local and state police departments during the evacuation process. In the act, written by Senator John Carona (R-Dallas) and with Rep. Frank Corte (R-San Antonio), all Texans are granted “safe passage” of their legally concealed or open carry firearm in times of evacuation. Shelters may have their own rules regarding firearms carry (concealed or open) for admission, but legally, all Texans can retain their firearm(s) while evacuating pending the exceptions noted in the bill.